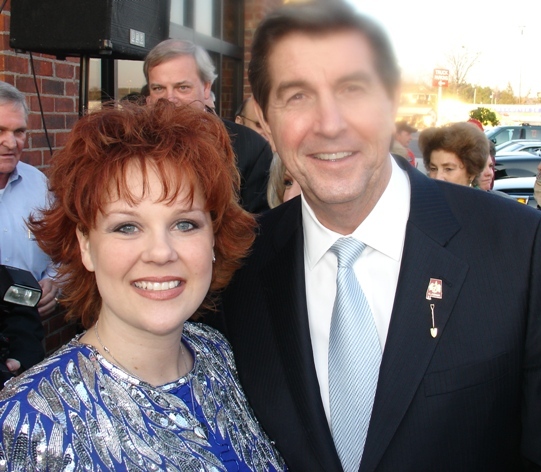 September 18, 2006 (Nicholasville,KY) A sold out crowd welcomed Tara Kay to country music superstar John Michael Montgomery's Restaurant , opening the show for Elvis Tribute Artists David Lee and Bill Kelly, Tara Kay performed her renditions of many of Reba's legendary hits. Wearing a black sequinned flowing dress Tara Kay commanded the stage and kicked off a memorable evening of music that these fans will be talking about for years to come. September 16, 2006 (Kitchener, Ontario Canada) Making her Canadian debute Tara Kay performed as a special guest at the King of Kitchener Festival. The performance took place at the the beautiful Transylvania Club. Tara Kay was a hit in this home of the maple leaf. She was so well received that you could very well see Canada back on her schedule in the future. May 5, 2006 (Las Vegas, NV) Seated onstage during the McEntire concert., Tara Kay attended Reba’s concert at the Las Vegas Hilton, Reba's exclusive concert venue for 2006. After the concert, Tara Kay went back stage and met the legendary Reba McEntire. Tara Kay gave Reba a shirt that she had made especially for Reba that said on the front “Starstruck over Reba” which was a play on words since Reba’s managing company is “Starstruck Entertainment”. On the back, the shirt said “#1 fan Tara Kay Birmingham, AL” As you can see in the photo to the left, you could tell that Reba was genuinely touched. Proceeds from Reba’s concert benefited her charity, Habitat for Humanity. August 19, 2009 Can you find Tara Kay in this picture? For Tara Roseberry, the transformation begins with the wigs. Two baby-blue carrying cases contain these precious items: a thick cascade of auburn curls that tumbles down past her shoulders and a short, spiky red shag that flips below her chin. "When I put on one of those wigs, I can say anything," Roseberry says. "It allows me to think, `You're a character now. It's OK to cut up with the crowd.'" Of course, other materials are necessary to complete the illusion: a slinky red evening gown, dramatic makeup, a silver locket, sparkly heels. Sometimes, she requires a fringed suede jacket, Western boots or a black retro jumpsuit with gold lame accents. 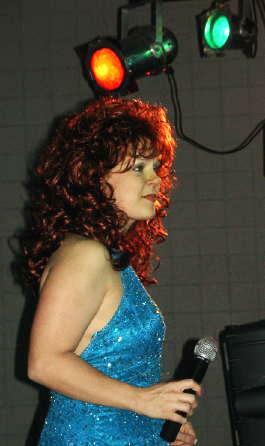 Visual details make all the difference when you're a Reba McEntire impersonator. Roseberry realized this about two years ago, when she started imitating the brassy, sassy country star from Oklahoma. "People hear you through their eyes," she says. "You've got to be able to sing, but the main thing is the hair and the look." Using the professional name Tara Kay, Roseberry, 32, has performed as McEntire at convention centers and nursing homes, theaters and hotel ballrooms. Most of the time, she's the opening act for her husband, David Lee Roseberry, a professional Elvis Presley impersonator. Although Roseberry's spouse makes his living by paying tribute to the King, she considers her Reba act a hobby or a moonlighting pleasure. "It's something I do when it works for me," Roseberry says. "I have too many other things that I can't set aside." When she's not belting "Fancy" jauntily into a microphone, tossing souvenirs into the crowd during "Little Rock" or taking grateful bows after "Whoever's in New England," Roseberry holds down a full-time administrative job at the Birmingham Jefferson Convention Complex. She also manages her husband's career - has done so since he launched his Elvis act about 10 years ago - and is a devoted mother to their 7-year-old daughter, Savannah. The Roseberrys live in Tarrant, but think nothing of driving up to 700 miles away from home for their weekend shows. Savannah goes with them and occasionally joins her mom for duets. "Sometimes it seems like there should be two of Tara," says Roseberry's husband, who performs under the stage name David Lee. "She's always doing something, always on the go. She'll be out there, working 10 minutes before a show. But when she gets on stage, you'd think she's been in a tour bus all day, doing her nails." Multi-tasking comes naturally to Roseberry, a graduate of Minor High School who grew up singing in the choir at a Methodist church. Organizational skills are built in, she says, and an outgoing personality led her to volunteer for solos and leads in youth pageants. As her husband's career took off, Roseberry restricted her adult singing to karaoke nights - which usually included a McEntire tune or two - and the odd performance for charity. 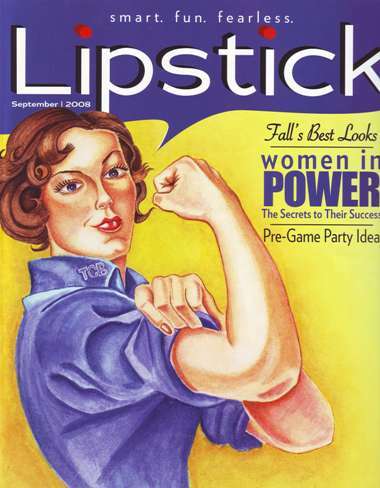 Dressing like McEntire never entered her mind, Roseberry says, until a friend asked her to do it for a Wal-Mart benefit in 2004. The resulting applause got her hooked. Roseberry began assembling costumes to reflect various periods of McEntire's career, from the rough-and-tumble cowgirl of the 1980s to the flashy diva of the'90s to the elegant showbiz veteran of today. Her set list grew and her confidence strengthened. "The first year was a learning curve," Roseberry admits. "David was very supportive and encouraging. He helped me come out of my shell. I learned to stay in character, to be more of an entertainer and to have a better rapport with the audience." These days, it's not unusual for Roseberry to receive flowers and gifts from audience members or to sign several autographs after her 20-30 minute sets. Her set length stretches to about 45 minutes when Roseberry headlines her own shows with other impersonators from the Birmingham area, including a faux Garth Brooks named P.W. Payton. Listeners always expect to hear "Fancy," she says, and a surprising number of people request "Climb That Mountain High." "I identify with Reba's songs, because they all tell real-life stories," Roseberry says. "The way she sings them, you'd think they really happened to her." Roseberry aims for a similar authenticity, although she never attempts to pass herself off as the real McEntire. Impersonators need to stay humble, she says, and to realize they'll never sound or look exactly like the genuine article. "You're not the person. You have to know you're not the person," she says. "But I've always been a fan of Reba's. Something about her drew me to her." McEntire's facial expressions and animated stage gestures aren't that difficult to imitate, Roseberry says, yet the Oklahoma twang can pose challenges. "When we do things up north, they think I sound exactly like Reba, because I'm a Southern talker," Roseberry says. "Down here, we know the accent's different." Everything Roseberry does as McEntire comes from her own instincts and initiatives. Presley tribute acts have many resources, but there aren't any Reba impersonator clubs, contests, guidebooks or costume companies. Still, the Tara Kay show is no rinky-dink operation. Roseberry has an official Web site (www.tarakay.com), a MySpace page (www.myspace.com/tarakayroseberry), a fan club and tour merchandise. Best of all, she says, is the luxury of having two show coordinators, Dale and Dru House. The Houses, a retired couple, volunteered a couple of years ago to handle the merchandise table. Their responsibilities now include marketing and promotion, overseeing the fan club, selling program ads, booking hotel rooms, carting costumes and assisting the Roseberrys with other tasks on the road. "We've seen people come to the shows from all over the United States," Dru House says. 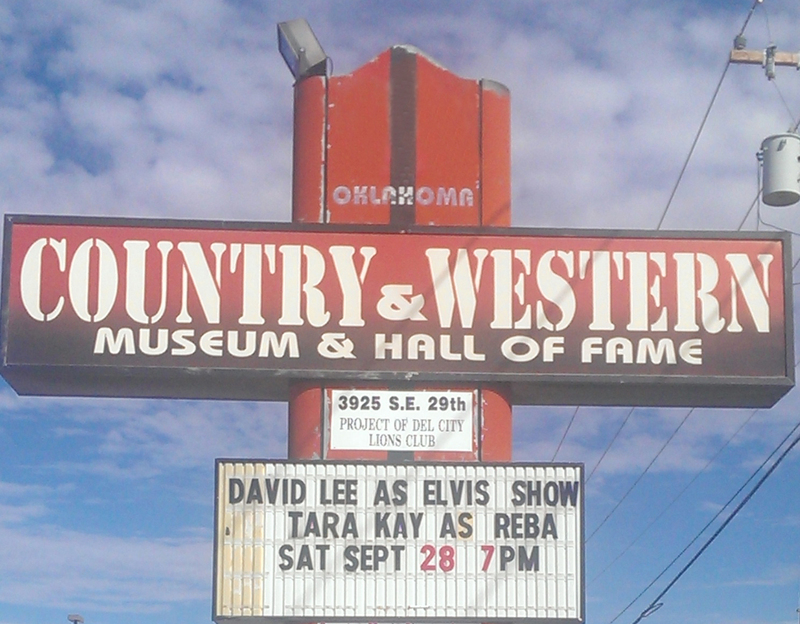 "The men come to see Reba and the women come to see David Lee. Fans want to know every little thing about them, and when they find out Reba's married to Elvis, they think that's a hoot." The Houses make sure Roseberry has a Diet Pepsi available during performances - her liquid of choice to keep the throat moist - and they've hustled to correct technical glitches like one that recently happened at the Aberdeen Municipal Building in Aberdeen, Ohio. "All of the lights went out and she was in total darkness," Dru House says. "The music continued, but she kept on singing and singing." As it turned out, food machines had overloaded the electrical circuits. Dale House, a handy guy, discovered the origin of the problem and simply rerouted the current. "Tara didn't miss a beat," he said. Roseberry did become tongue-tied, however, when she encountered her idol in person earlier this year, during a meet-and-greet at the Las Vegas Hilton. Fan club tickets for a McEntire concert on May 5 also entitled the bearers to a little face time with Reba. "I was starstruck," Roseberry says. "My heart was fluttering." 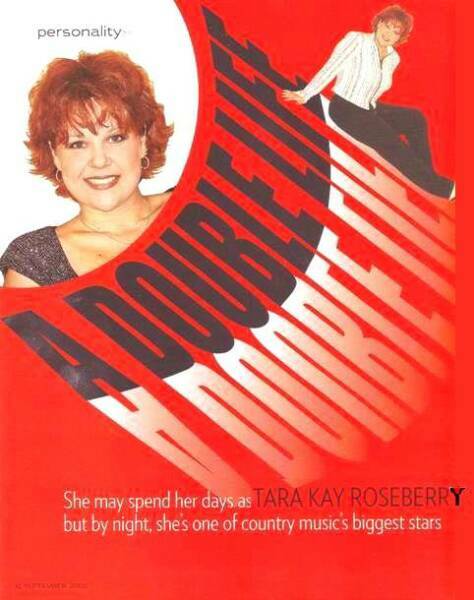 Instead of mentioning her tribute act, Roseberry gave McEntire a specially printed T-shirt that said Tara Kay from Birmingham was her No. 1 fan. A quick photo session and autograph signing followed. McEntire never knew that a clone was close at hand. But the singer says she embraces the idea of impersonators and even brought one on tour a few years back to do a stunt for "Fancy." "I think it's pretty easy to do my mannerisms, which are so distinct and particular," says McEntire. "I met a male impersonator once who did a Reba, and I was trying to check out how he did his hair and makeup. "After all," she says, "I always thought imitation was the highest form of flattery." June 5, 2008 (Alexander City, AL) Tara Kay performed on "The Barnyard Jamboree" WAXC which is a 30 minute variety show hosted by Kenny Dean. The Barnyard showcases all types of talented acts including musical, comedic, and many others. Tara Kay was honored to be selected to sing her rendition of "Fancy", "Can't Even Get The Blues", "Have I Got A Deal For You" and "Climb That Mountain High". Also a heart felt "Somebody Should Leave” and "My Sister". Tara Kay was asked to perform an encore song and the producer chose "Whoever's In New England". 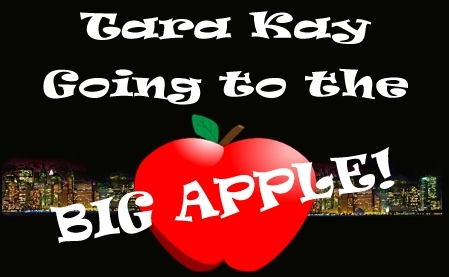 Tara Kay will be aired on the show multiple times throughout the next few months. Check to your local tv guide to see what channel WAXC is for your area. 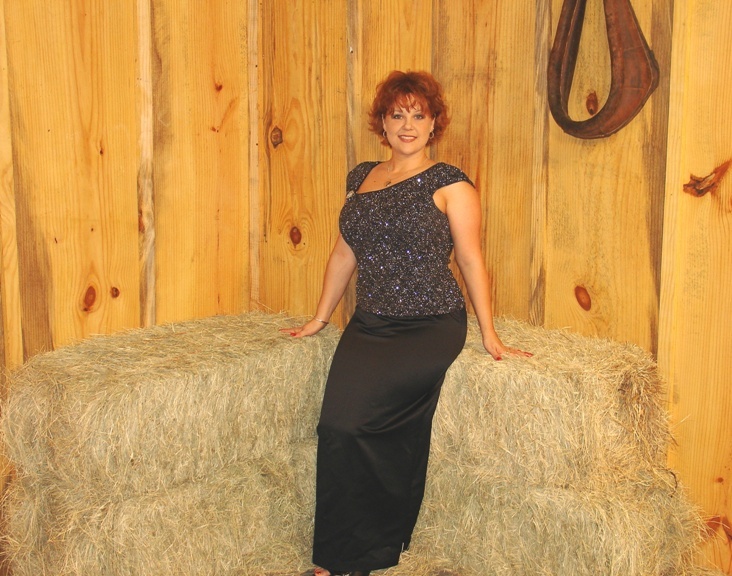 By day, Tara Kay Roseberry is the Contract Specialist Administrator for the Birmingham Jefferson Convention Complex, but once the lights go down she leads a much “fancier” life – as Reba McEntire impersonator. When you meet Tara in person you immediately notice her resemblance to the country maven, but with the addition of a red wig, a sequined evening gown and mile-high heels, the likeness grows. Then Tara sings, and it’s as if you’ve been transported from Graysville to the Grand Ole Opry. A Birmingham native, Tara grew up singing in the Methodist church choir, cheering and dancing. As an adult, there was the odd karaoke night, but she put her own musical aspirations aside in favor of her job with the BJCC, managing her husband, David Lee in his full-time career as a World-Champion Elvis impersonator, and being a devoted mother to their daughter, Savannah. 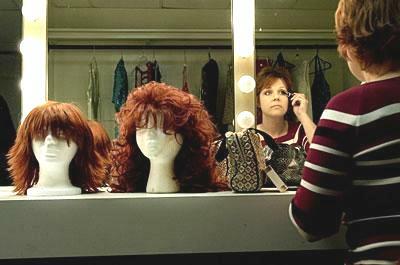 Becoming Reba was the furtherest thing from her mind. Even though she loves all sorts of music from alternative to rap, Tara’s vocal abilities, by her own admission, are best suited to country music, and Reba’s songs came naturally to her, although Reba’s spoken Oklahoma drawl can be hard to mimic. “When I’m up North though,” Tara says, “They don’t notice a difference in our accents. They think all Southerners sound the same”. By carefully studying videos of Reba McEntire, Tara began to master Reba’s characteristics mannerisms and phraseology in order to further hone her act. “She’s very easy to imitate because she tells stories in her songs and through her gestures,” says Tara. 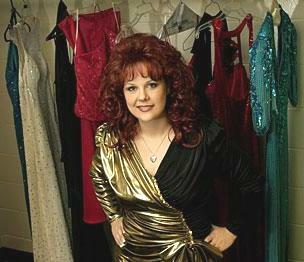 Tara also does all of her own costuming and styling for every era of Reba’s career from the ‘80’s-era long ‘do to a heart-shaped locket. Nearly two years after that first performance, Tara still enjoys her “hobby that pays” – as do many loyal fans who follow the act. Tara’s one regret about her act is that she usually does not get to spend the time she would like with her fans who sometimes even bring her flowers or gifts. The best gift to Tara, however, is not wrapped in paper. “I love for people to sing along,” she says “because it let’s you know that the audience is enjoying what you’re doing”. For the Roseberry’s, singing is a family affair. From New England to Arkansas, Georgia to Kentucky and even as far away as Canada, the Roseberry’s and their nine-year-old daughter Savannah think nothing of driving hundreds of miles for a show, competition or convention. And while Savannah may occasionally be asked to join her mama in a rousing rendition of “Can’t Even Get the Blues”, it’s not the bright lights, makeup and costumes she loves. “We try to do most of our traveling on the weekends and in the summer so that Savannah can go with us and still have as normal a life as possible,” Tara Says. “She really loves the traveling”. And who wouldn’t? Unbeknownst to most of us, there is an enormous subculture of impersonators who travel the world to show off their talent for mimicry. “If you were a dog trainer, “Tara says, “You’d hang out with other dog trainers.” So it goes in the world of celebrity imposters. From Garth Brooks to Cher to Joan Rivers, Tara has seen them all. November 14, 2008 (Birmingham, AL) Once again, Tara Kay met the legendary McEntire but this time on her own stopping ground in Birmingham, AL. Accompanying Ms. McEntire was none other than Idol Winner Kelly Clarkson. It was an honor for Tara Kay to chit chat with these two superstars backstage. Tara Kay was wearing a sweater from Reba’s clothing line. It impressed Tara Kay that Reba noticed it was a piece from her line and complimented Tara Kay on how well she looked in that color green. May 9, 2009 (Nashville, TN) Tara Kay has just returned from Nashville for quite an exciting trip! 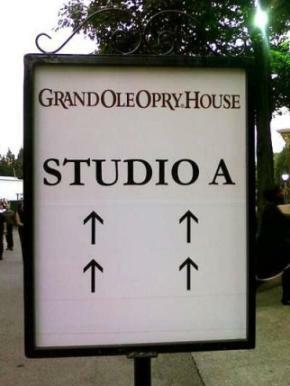 She was invited to the “By Invitation Only” CMT taping at the Grand Ole Opry Studio A of a Reba special that will be airing on August 21st. In a very intimate setting, Tara Kay sat just a few feet away from the back-up singers, with the Queen of Country standing only a mere 10 feet in front of her. Reba sang several songs from her new album that will be debuting this summer as well as classic favorites. Tara Kay was honored to be included in this event. 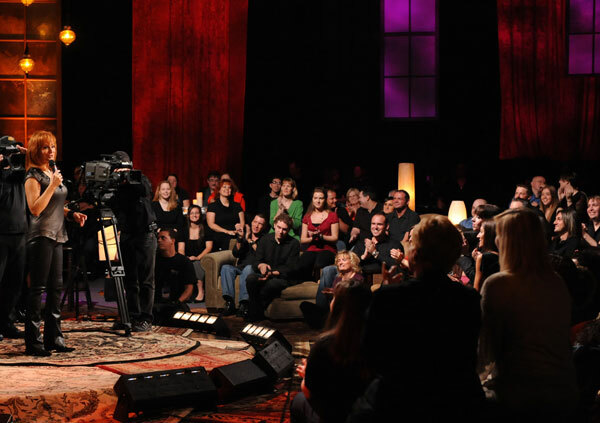 Don’t miss this airing; you could very well see Tara Kay in clips of the audience. 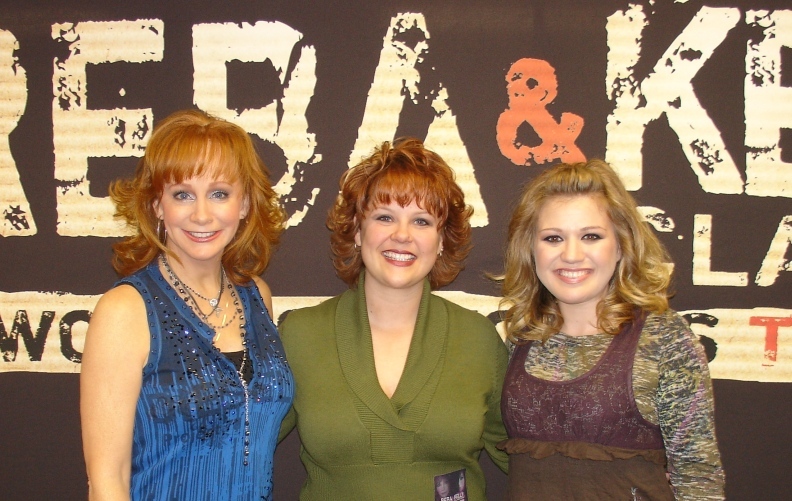 As you may recall back on May 9, 2009, Tara Kay went to Nashville, TN to be apart of Reba's CMT Invitation Only taping. 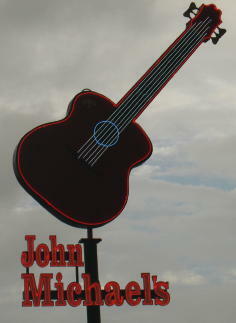 The show will aire on CMT on Aug 21st at 9pm, Aug 22nd at 10 am and Aug 23rd at 10 am, Aug 25th at 12pm and Aug 30th at 10 am. We are very excited to say there are several glimpses of Tara Kay throughout this show. November 1, 2010 (New York City, NY) All The Women I Am - Reba Impersonator Contest NOV 7th at THERAPY in NYC. Tara Kay has been chosen for the TOP 12. These 12 contestants will be performing a Reba song of their choosing. Their performance will be streamed live via Ustream on Reba's Facebook where her fans will be voting to select 3 semi-finalists. The 3 semi-finalists must then perform the title track of Reba's new album, ALL THE THE WOMEN I AM. A grand prize winner will be selected to receive a meet and greet with Reba! VOTE for TARA KAY on THIS SUNDAY, NOV 7th. November 9, 2010 (New York City, NY) Birmingham's own, Tara Kay was Reba's guest on the Good Morning America show where she had a VIP area to stand next to Reba’s band and was taken on a VIP tour while the GMA show was LIVE. GMA showed glimpses of Tara Kay during the November 9th show and two good close-ups. This was an exciting trip for Tara Kay and very good experience. November 23, 2010 (Birmingham, AL) Tara Kay was a featured guest on the Talk of Alabama Morning Show where she talked about her trip to NYC and sang "Fancy". September 17, 2010 (Birmingham, AL) Tara Kay was honored to present Reba McEntire and Lee Ann Womack framed, one of a kind Hatch Show Prints with gold plaques saying "Thank you for playing the BJCC"
Tara Kay performs at the Country and Western Museum & Hall of Fame. During her performance, Tara Kay sang an original song she wrote titled "I Don't Wanna Go". Click here to see this performance. 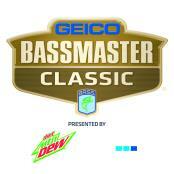 Tara Kay was extremely honored to be asked to sing the National Anthem at the 2014 BassMaster Classic at the BJCC Arena. Tara Kay was thrilled to be asked to sing the National Anthem at the 2017 National Senior Games.